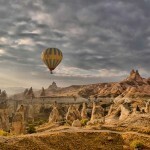 One of the most exciting adventures in Cappadocia is exploring the region in an off-road vehicle. Jeep Safari tour offers you the best of the best: open-top jeep vehicles for unobstructed views of the valleys, churches and other cultural highlights. We take you to the hard-to-find places and away from the crowds for spectacular views and the excitement of traveling off-road in the unique landscapes of Cappadocia – all in one day. We offer half day and full day tours and the itinerary. This trip starts either around 10:00 in the morning or 14:00 in the afternoon and takes about 4 hours. We will pick you up from your hotel and start our adventure trip by driving from Goreme to Cavusin via Love Valley. We will have couple picture stops on the way until driving Cavusin village. In this small, lovely town you can walk up to the old city carved into rocks and see St. John the Baptist church, one of the oldest cave churches in Cappadocia. Old Houses in Cavusin Our adventure will go on by Ortahisar town. We will drive Ortahisar via Rose Valley and again stop for quick picture stops. When we see picturesque Ortahisar village and castle, we will drive into Uzengi Valley and drive in Uzengi brook! We will also see hundreds of pigeon houses carved into rocks in this valley. Right after this off-road adventure, we will go to Mustafapasa village, a former Greek town which was inhabited by “Rums” (Greeks) until 1924 population exchange. We can also have a stop for drinks in this town and then drive to back to Goreme via Pancarlik, Pigeons and Babaccik valleys. Finally we will drop you off in your hotel. The tour travels about 50 km and lasts 4 hours. The rate is per person and including driver, petrol and taxes. The driver has basic English and he will drive you from one site to another. He will not be able to explain the sites. This trip starts around 10:00 in the morning and finish around 16:30 in the evening. We will pick you up from your hotel and start our adventure trip by driving from Goreme to Ortahisar. Ortahisar is one of the small towns of Cappadocia with a picturesque rock-cut castle used as a fortress until medieval-ages. We will then drive to Uzengi Valley and actually drive in Uzengi brook! We will also see hundreds of pigeon houses carved into rocks in this valley. 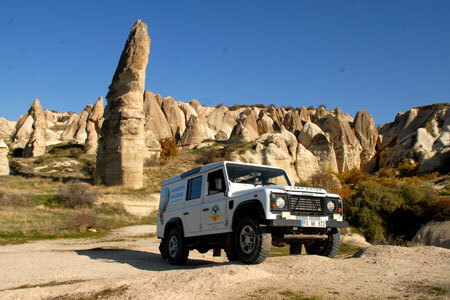 After this 4×4 off-road adventure, we will drive to Gomeda Valley and explore one of the hidden beauties of Cappadocia. This valley is known to be the most greenery valley of Cappadocia. 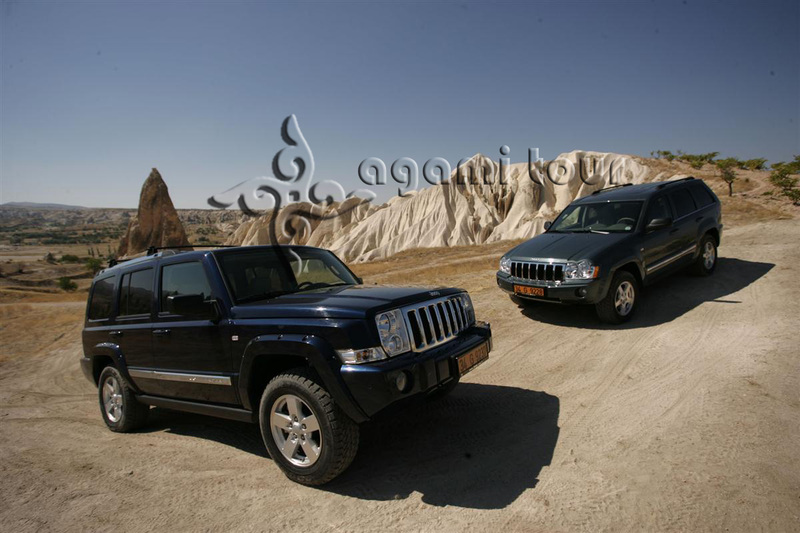 Cappadocia Jeep Safari Tour Then we will drive to Golgoli hills which has lovely rock formations located next to Damsa Lake. Golgoli is also a famous sky observing area in the evenings and used by TUBITAK (The Scientific and Technological Research Council of Turkey) for summer camps. Our last stop before having lunch in Urgup will be Mustafapasa village, a former Greek town which was inhabited by “Rums” (Greeks) until 1924 population exchange. You can visit the old Greek mansions and have a short walk in this town. Around 13:00, we will have lunch in a restaurant in Urgup. After we have our lunch, we will drive to Cavusin Village via Red Valley to Rose Valley vista point. In this small, lovely town you can walk up to old city carved into rocks and see St. John the Baptist church, one of the oldest cave churches in Cappadocia. Before driving back to your hotel we will drive in Love Valley and see the highest fairy-chimneys (volcanic rock formations) of Cappadocia. We will then drop you off in your hotel. The tour travels about 100 km and lasts 6 hours. The rate is per person and including driver, petrol, lunch and taxes. The driver has basic English and we will drive you from one site to another. He will not be able to explain the sites. Please ask for the rates for private or regular jeep safari.